1. Start by chopping up the butter in cubes and place in a medium sized pot (cutting the butter helps the butter to melt evenly and quickly). Melt butter over a low-to medium heat and mix in brown sugar and white sugar until well blended. Set aside to cool slightly (we need to add the eggs soon and we don’t want them to cook). 2. In a medium sized bowl, sift together the flour, baking soda and salt and then whisk them together to ensure that they are evenly distributed. Set this aside. 3. To the butter mixture, add vanilla, egg and egg yolk and beat until light and creamy. 4. Now add the sifted ingredients until just blended. Check the temperature of the dough with your hand. If it’s still really warm, it may melt the chocolate. In which case, leave in the fridge for a a few minutes to cool slightly. Once it’s cool enough, stir in the chocolate. 5. Roll the mixture into walnut sized balls (it’s easier to do this if mixture has been chilled in the fridge for several minutes first), place back into the bowl and refrigerate (bowl and all) for a minimum of 15 minutes or ideally over night – as noted in the post above, this helps the flavours to intensify and prevents the cookies from spreading too quickly when cooking. 6. 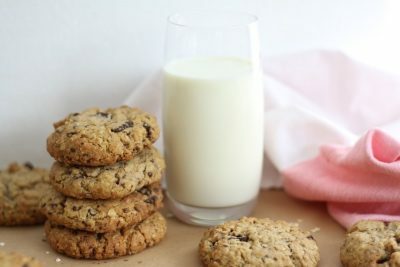 Once your cookies have chilled, preheat your oven to 165 Degrees Celsius (329 Degrees Fahrenheit) and grease a baking tray or line with baking paper. 7. 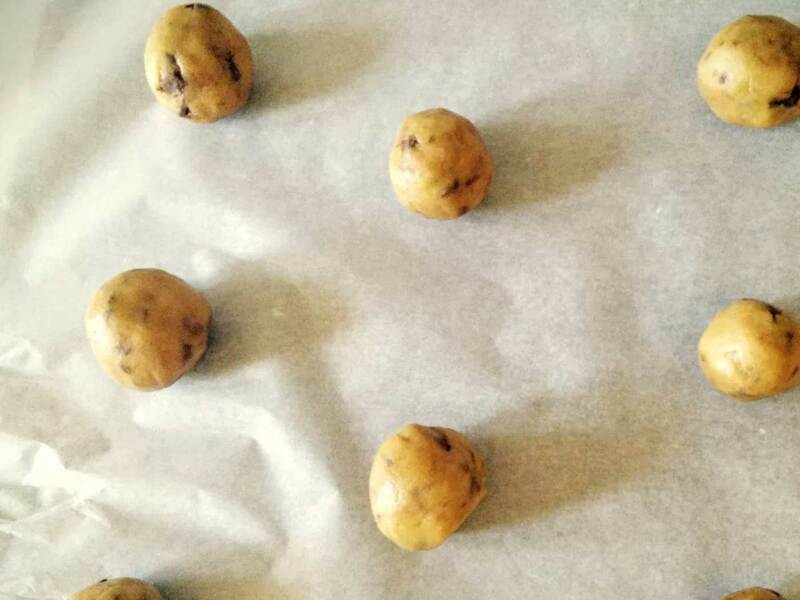 Place cookie dough balls onto the baking tray, but do not press down (i.e. leave them as balls). Cookies should be about 8 cm apart. The cookies will look really soft and as though they are not quite done – this is when you need to take them out. They will continue to cook slightly on the tray and will set in a couple of minutes. Place onto a wire rack to cool and then devour. *Watch these little beauties carefully after 12 minutes. My oven bakes them perfectly at exactly 15 minutes but all ovens differ slightly. 1.These cookies taste even better on the second day after they are made. They will keep for up to a week, stored in an airtight container. 2. 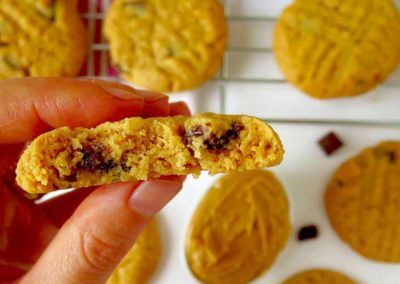 Keep them for later: Uncooked cookie dough freezes really well. Just place the rolled cookie dough balls in an airtight container and place in the freezer. I often do this with half of the mixture – that way I always have cookies ready to go when needed. 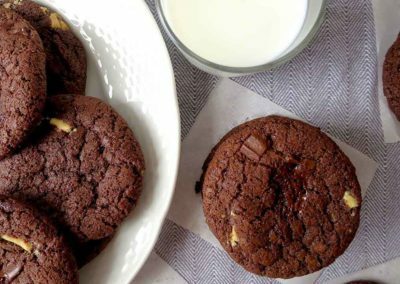 These chocolate chunk cookies have everything you want a cookie to be – just the right amount of chewiness, fudgy-ness, crispness and sweetness. 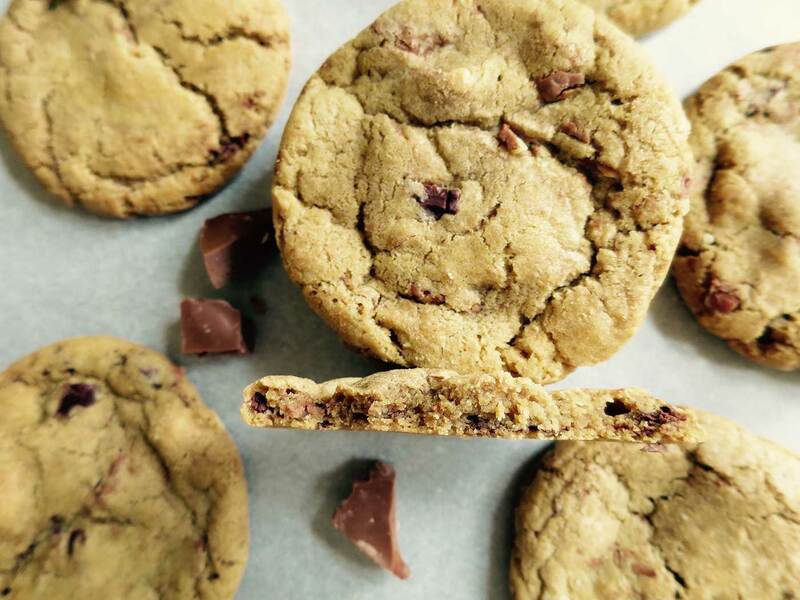 If you’re not a cookie lover, I think you’re about to be. 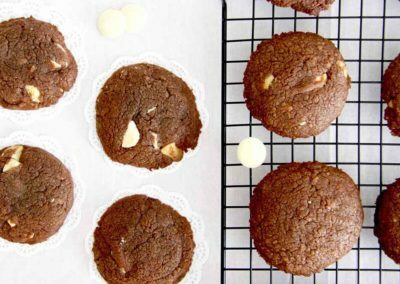 My favourite chocolate cookie recipe of all time. 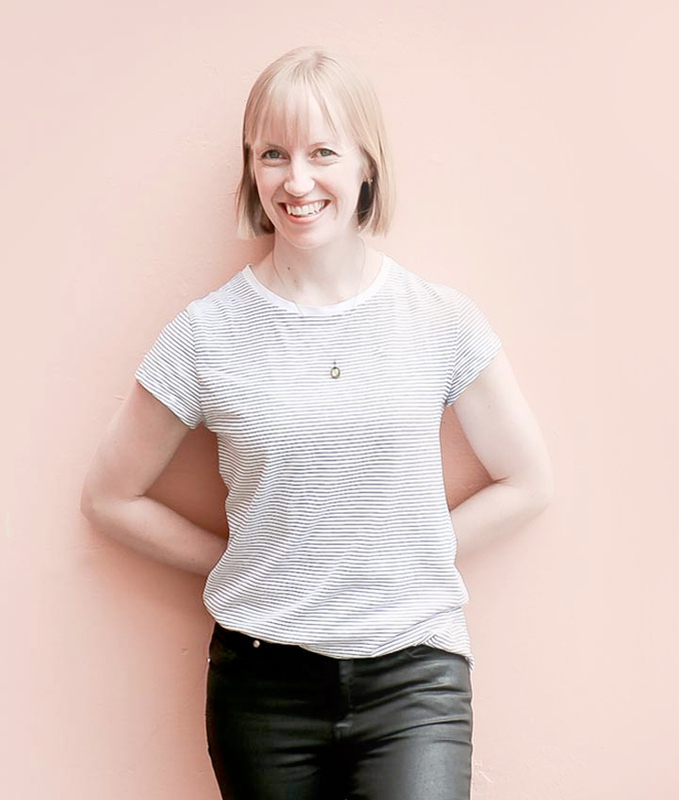 This is my first blog post and I’ve decided to bring you only the best. 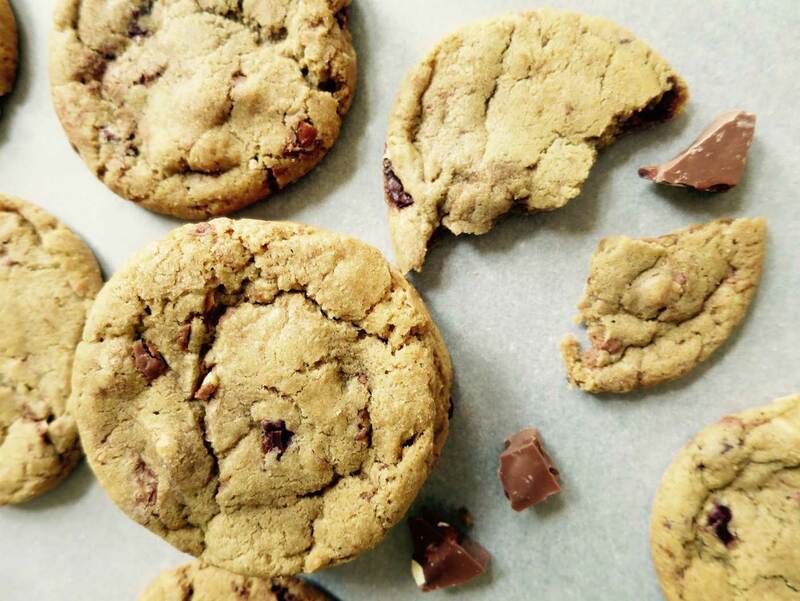 The best chocolate chunk cookies that is. 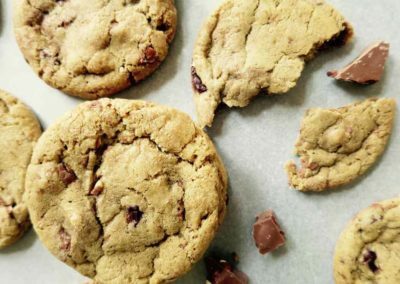 My hunt for the best chocolate chunk cookie lasted several years, but it stopped when I found this recipe. Well actually I didn’t find it, it found me. My girlfriend Sam gave it to me when she came to visit Kevin and I in Brno and said they were the best she’d ever tasted. I was a little skeptical, but when we made a batch I was immediately hooked. 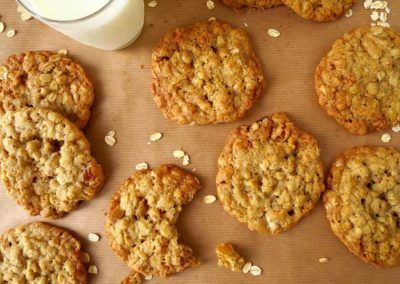 So watch out, this may become your new favourite cookie recipe too.This recipe is used in the first class of my baking course and it’s a hit. Easy and delicious – good combo yes? So what makes these cookies so good you may ask? 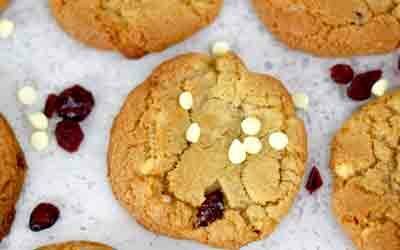 Let me reveal some of the baking secrets behind these mouthwatering cookies to help answer your question. 1. Most cookie dough recipes cream the butter and sugar together to create air, resulting in a lighter, cake-like cookie texture. 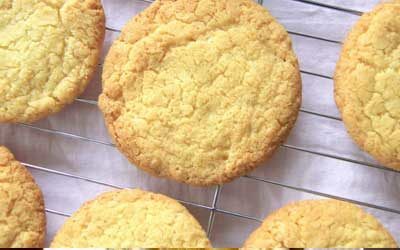 These cookies however require melted butter which contributes to the fudgy, chewy texture. No creaming method needed here. 2. One egg plus one egg yolk is used (instead of two whole eggs in other recipes). Egg whites help add lift but can also dry baked goods out. 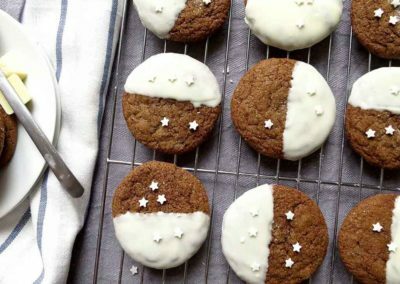 Removing one egg white prevents this extra lift and drying out which thus results in a more dense, more tender and more fudgy cookie. 3. Both brown sugar and white sugar are used. Brown sugar and white sugar serve different purposes in baking. Brown sugar is usually used to provide moisture, richness and fudginess, whereas white sugar creates crispy and crunchy texture. This cookie has a good combination of both. “How do get your cookies so round?” They’ll think you’re amazing. 5. Baking soda is the only leavener used. Baking soda here serves two purposes in this recipe: first it helps the cookies to spread instead of ‘puff’ (that’s how we get that Subway cookie look), secondly it neutralises the brown sugar which is an acidic ingredient. See here for more info on baking soda and baking powder. 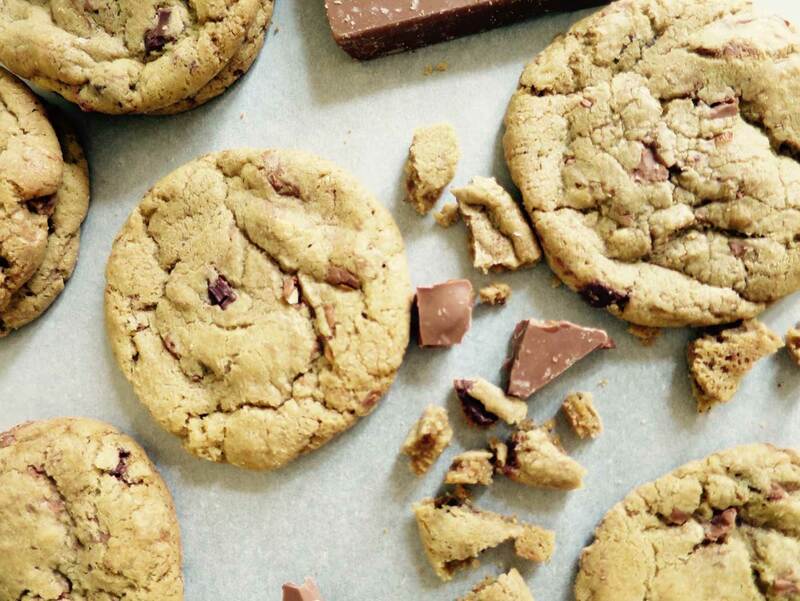 So there we have it, all you need to know to make the best chocolate chunk cookies. Give them a try and let me know what you think. Are they the best you’ve ever had?